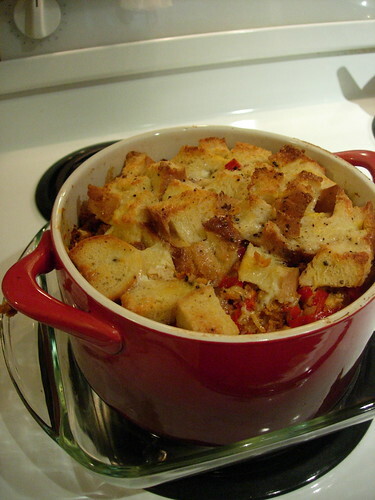 A few months back I came across a recipe for a fabulous SAVOURY bread pudding. Yes, you heard me right- savoury. As in - not including chocolate chips. I swooned. I baked. I devoured. Since then I've tampered with the recipe only slightly - including different cheeses, using different types of breads, increasing the rosemary etc. And trust me - nothing can ruin this recipe. It's absolutely freaking delicious. Up until this point my basic bread pudding has consisted of any or all of the following: asparagus, spinach, mushrooms, sourdough bread, potato bread, rosemary, sage and cracked pepper. As for cheeses I've basically been sticking to a mixture of fontina and gruyere - both creamy and slightly stinky. Delish. Last week while cleaning out the freezer I came across the vegetarian chipotle sausage that I smuggled across the border from Trader Joe's (Oh Joe, when will you come visit your friends to the north!!??) and I was hit by a culinary lightening bolt - SPICY BREAD PUDDING! Try this my friends and you will be hooked. 1 loaf stale bread - I bought the day olds from the Market Bakery for $1!, consisted of an old olive bread, some multigrain buns and a small sourdough bun. Chop up the bread into bite size cubes. Should measure about 3 cups. 1. cube the bread and lay it out to dry for at least an hour, sometimes overnight if it's too fresh. this is where stale bread comes in handy. 2. fry up your hot stuff - sausage, shallots, red pepper and mushrooms. leave this to cool slightly, you don't want it to melt the cheese. 3. whisk up the eggs and milk. 4. in a large bowl combine the bread, grated cheese and the sausage mixture - i do this with my hands. then move this to a large dutch oven or covered casserole dish. 5. pour the egg/milk mixture and the stock over the bread. 6. let to sit overnight - at least 8 hours for the bread to soak up all the goodness. 7. i like to sprinkle a little extra cheese and grated pepper on top right before it goes in the oven. 8. casserole dish will need to sit inside a water bath in the oven - i do this by placing the dish into a 9x9 glass brownie pan and surrounding it with hot water. this is important. do not roll your eyes and skip this step. 9. place the whole thing into a 350 degree oven. 10. the pudding will need to bake for at least 55 minutes then take the lid off for another 10. The egg mixture keeps the bread ultra moist and reminds me of my mom's turkey stuffing. I'm sure there are a million amazing variations that can be made on savoury bread pudding. But this was definitely a fave - I ate it all week with some adzuki bean stew. Further evidence of its deliciousness - the bf cleaned out the leftovers and the bf NEVER cleans out the leftovers. Let me know how it goes! Julie & Julia. The fury and fantasy of a foodie.